Construction safety images are an important component to a company safety plan and even more useful when training new employees or students about this form of safety. Here's how to find some great images that will improve safety in a construction area. Find free images or images you can use freely as long as you get permission. Purchase images or even purchase an entire set. There are obviously pros and cons to each method. The major pro is the same across the board - you have images to use that can help increase safety. The cons differ somewhat. Free images are not always as good as ones that cost money and can be harder to find and harder to fit to your specific construction safety needs. Additionally, free images can be time-consuming because sometimes you'll need to gain permission. Images that cost money, well, they cost money. Sometimes images can be very expensive. Lastly while creating your own images can be done, it's time consuming and in some cases impossible. Are you really going to pose an employee in a pool of water and add an electrical cord? No. Also, images related to heavy construction equipment safety are hard to re-create with a camera unless you have a professional photographer and then you're looking at spending a lot of money. Below are options for finding free, low-cost and higher cost construction safety images - take a look and then make a decision based on your company's personal needs. The Occupational Safety & Health Administration (OSHA) has a great Jobsite Safety and Health available at their website resources for various occupations. The hand book has a wide array of good black and white graphics. The only caveat is that it's unclear if they are free and clear to use. It seems like all you have to do is contact OSHA for permission and not reproduce them for profit. You may in fact want to contact OSHA and simply ask if they have photos available. Its job is to help companies be safe and they very likely will help you locate the perfect images along with free workplace safety tips. Free Foto has some decent photos and they can be used for Web site manuals or training as well. Every Stock Photo is somewhat free. How it works is you search for say, "safety images" and free photos pop up. They also have a side column from their partner Fotolia who offers inexpensive images. Prices here will not be listed as prices are so variable and change often. However, all of these places sell images for low to mid range budgets. Nothing too expensive is in this category. If you only need maybe 10-15 images than presentation pictures is a good deal and have a decent amount of construction images. 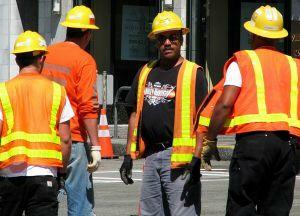 My Construction Photos has a multitude of construction safety photos and they're a great deal and well done. The problem with buying expensive images is that they get so costly that you may as well pay a professional safety instructor to set up a safety program complete with images for your company. If you're going to pay a lot you may as well get an entire safety program. If you want to learn more about professional trainings in the industry contact The Construction Safety Council.